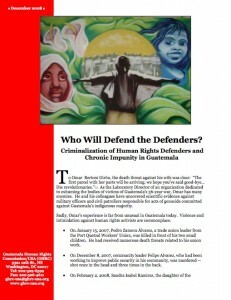 El Quetzal is a publication covering GHRC’s work, recent news and human rights updates from Guatemala, and much more. 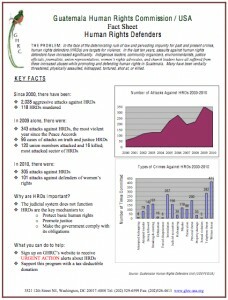 Learn about Guatemala, and have some facts at your fingertips, with these quick reference guides that include detailed informationon issues such as immigration, femicide, human rights defenders, drug trafficking, gangs, and more. 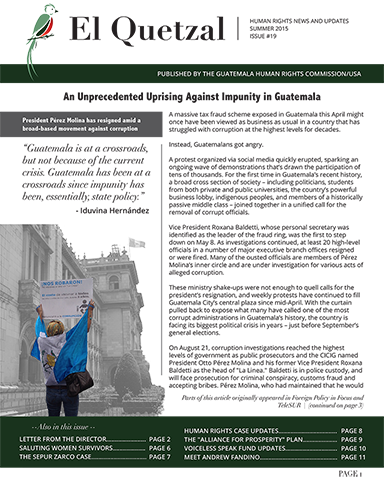 GHRC has published several in-depth reports on femicide and human rights defenders in Guatemala, as well as a series of reports monitoring the impacts, effects and implications of the Central American Free Trade Agreement throughout the region. Our Human Rights UPDATE provided a bi-weekly update of the most pertinent human rights news, actions and cases in Guatemala. 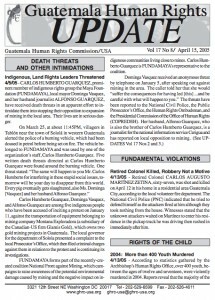 The Human Rights Review served as an annual review of documenting Guatemala’s human rights situation. While no longer in publication, all past reviews and updates are available in our Publications archive.